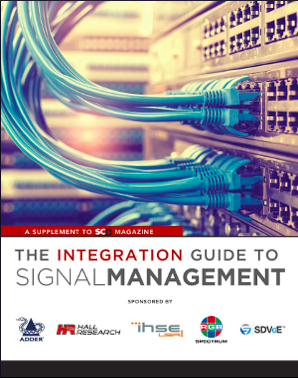 Get your free copy of The Integration Guide to Signal Management! What's New With Signal Management? Is there a “best” way to extend HD and UHD over long distances? Topics explored will include HDBaseT over IP vs the new Software Defined Video over Ethernet (SDVoE), encoding challenges, the new HDMI 2.1 standards, and latency tolerance. We explore the forward-thinking technological innovations in signal management featuring Adder, Hall Research, IHSE, RGB Spectrum, and SDVoE. SCN asks industry thought leaders their opinions on the recently updated HDMI 2.1 standards and dives into how these changes will revolutionize our industry.